Myth: Aerosol sprays damage the Earth’s ozone layer. This misconception stems primarily from the fact that, originally, aerosol cans used chlorofluorocarbons as a propellant. Chlorofluorocarbons were also used commonly in refrigerators, air conditioners, and for many industrial applications. Chlorofluorocarbons were particularly popular because they are non-flammable, non-toxic, and non-reactive to most compounds. However, after scientists began to observe that the Earth’s ozone layer was thinning beyond normal seasonal variations, in 1974, Nobel Prize winner Dr. F. Sherwood Rowland and Dr. Mario Molina discovered that these chlorofluorocarbons were the likely cause of the damage to the ozone layer, though this wasn’t conclusively proven until 1984. Despite the lack of conclusive evidence, in the mid-1970s most manufacturers voluntarily stopped using chlorofluorocarbons. Further, in 1978, chlorofluorocarbons were officially banned in the United States, with a few exceptions. These exceptions were primarily concerning certain medical applications, such as with asthma inhalers (though use in inhalers and other medicinal applications were officially banned in 2008). Other countries quickly followed the U.S. in banning the use of chlorofluorocarbons, including Canada, Mexico, Australian, and many European nations. Thanks to the Montreal Protocol agreement, ratified by 70 countries initially and 196 countries to date, production of chlorofluorocarbons, along with other ozone damaging substances, began to be phased out altogether starting in 1996, the completion of which, even in many developing countries, took place in 2010. So the bottom line is that for the last three decades or so in the U.S., followed by many other developed countries shortly thereafter, aerosol sprays haven’t contained any known ozone depleting substances. The first aerosol can was designed by Eric Rotheim and patented in 1931. His invention wasn’t used popularly until WWII when it was used by the military to hold insecticide, particularly in the Pacific, where mosquitoes were a major issue, both as an annoyance and a spreader of disease. Environmental models have indicated that around the year 2050 the Earth’s ozone layer should make a complete recovery from the damage inflicted due to the chlorofluorocarbons in the four or five decades they were being heavily used for industrial and domestic applications. The Earth’s ozone layer, which is in the stratosphere around 6-30 miles above the Earth’s surface, filters out a large amount of ultraviolet radiation from the Sun. It is primarily created by UV rays reacting to oxygen. Ozone itself is a triatomic molecule, made of three oxygen atoms. It is extremely toxic to breathe and is also highly damaging to certain plants. It also has a damaging effect on certain inorganic compounds, such as plastic. It was first discovered by Christian Friedrich Schönbein in 1840 and was the first allotrope of a chemical element to be discovered. Humans can smell incredibly small amounts of ozone in the air, down to around 0.1 µmol/mol, which is perhaps not coincidentally the level at which ozone will start to produce negative effects in humans, such as headaches, burning eyes, and lung irritation. The smell is usually described as similar to bleach and can often be smelled after heavy lightning storms. Ozone not only filters out UV radiation, but also has many industrial applications, such as: a powerful disinfectant and sanitizer, used in hospitals, food factories, public pools, and water treatment plants; a deodorizer, often used in fabric restoration; and as an insecticide in granaries and other food storage facilities. 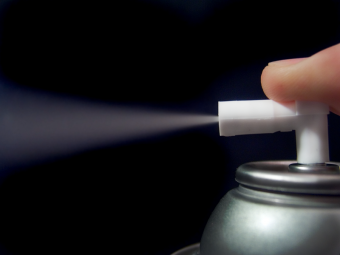 As you might have guessed from the name, “aerosol” (derived more or less from “air-solid”) is technically just the suspension of fine particles, such as solids or liquid droplets, in a gas. As such, clouds, smog, smoke, air born dust, etc. are all aerosols. About 90% of all aerosols are naturally produced and are critical to cloud formation, with most aerosols providing a type of “seed” or cloud condensation nuclei for the clouds to form from. Many types of aerosols have a cooling effect on the Earth, such as the aerosols produced from the burning of fossil fuels. The aerosols produced from this are known to partially counteract global warming caused by various greenhouse gases, such as carbon dioxide. Before you get too excited about that cooling effect, though, you should know that this is taken into account by most global warming and climate projection models. Today a variety of different propellants are used in aerosol cans, with liquefied petroleum gas being among the most popular. Not only do aerosol sprays not hurt the ozone layer, but they also reduce waste thanks to their extremely long shelf life and the fact that the containers themselves are easily recyclable. Further, typically about 25% of the cans are made from previously recycled materials. The most popular form of Aerosol can works by storing some fluid under very high pressure, which then propels some other fluid out of the can when an opening is introduced. More specifically, the propellant is some fluid that boils at well below room temperature and the other fluid (product), like hairspray, insect repellant, or paint, boils at much higher temperatures than room temperature. Usually, the product is put in the can first. Next, the can is sealed and then the propellant is pumped in at high pressure so it’s forced to stay in liquid form. The spring loaded valve is at the top, with a long stem attached that goes to the bottom. When the valve is open, the high pressure propellant above the product liquid is able to expand and form a gas layer, which then pushes down on the product and some of the remaining propellant still in liquid form. This results in the liquids being squirted out. The nozzle is also constructed such that it will atomize the liquid as it is sprayed out, making tiny little drops. The propellant itself, when squirted out with the product liquid, also can help to atomize the product as the propellant rapidly expands once free of the high pressure of the can. This rapid expansion can also be used to help form foam bubbles, such as with whip cream or spray insulation. The curvature on the bottom of aerosol cans not only provides greater structural integrity, but also makes it more efficient in terms of being able to use nearly all the product in the can, with the end of the straw sitting in the corner of the can. “Whirlwinds and updraft” is a pretty accurate response. When it comes to gasses in the atmosphere you cant just sort them after density. Then we would have clear cut layers with one type of gas in each. Instead the sun lights up the equator and creates temperature differences between the poles, thereby creating wind. There are also some other forces impacting wind flow (For instance the coriolis-effect). It would be unwise to underrestimate the power of these wind systems as you’ve probably heard about tornadoes and hurricanes picking up even houses. A good example of when wind lifts heavier particles would be how the trees in the rainforest releases a lot of pollen at the same time. This pollen gets lifted in to the atmosphere and serves as a base which water can condense on. This intensifies rain in the area. There is no doubt that the CFC-gasses can get up to the ozone layer. There is also no doubt that these gasses are harmful to the ozone. A single Cl- ione can catalyst up to 100 000 ozone depletion reactions. But I do however agree that the timing is quite peculiar. But we can attribute this to the lifetime of patent which is 20 years. This is not a long time to do research on meteorologic phenomena. First, as you can imagine, there were more “whirlwinds and updrafts” being blown *at* you. Indeed, the chemical makeup of CFCs are such that they are much heavier than air. Like Kim wrote, updrafts even pick up houses. Like Kim failed to mention, like houses, they also come back to Earth. Also, Kim failed to mention that even if that chlorine ion were capable of catalyzing up to 100,000 ozone molecules, the amount of CFCs that have ever been created by man in the history of man-made CFCs, it would not even come close to being capable of depleting the amount of ozone that was supposedly depleted. Even if every man-made CFC were somehow transported to the ozone layer. Now, one thing that Kim did mention is that 20 years is not a long time to do research on meteorologic[al] phenomena. This is indeed the truth. See, the fallacy of the whole “Man made a hole in the ozone layer” argument is indeed disproved by a few facts that emotionally driven scientists and politicians didn’t care to consider. The first fact is that we had not even been studying the ozone layer for anywhere close to an adequate amount of time. The technology to do so wasn’t available until the 70s, and even then only limited non-specific data was available. The second fact is that this “hole” in the ozone layer literally happened quite quickly, between 1981 and 1984. That is literally all of the “evidence” that was given to amazingly say irrefutably that Man’s activities – which had been happening since the early 20th century – in creating CFCs is undoubtedly the exact cause of this “hole” suddenly appearing. No long-term study, no chance for other theories to be found, just a wholesale sell to the politicians that man caused this hole in the ozone layer, based on very little evidence. Sound familiar to more modern happenings? It should. The third fact is that ozone is constantly being replenished. So basically, scientists found a less than 5% reduction over a very short time period, and the media and emotional politicians and scientists immediately started ballyhooing about how it was all caused by man. No long term studies to determine if it was a typical cyclic event. No rational thought to the volume of CFCs ever produced as compared with the volume of the ozone layer. No look at any other reasons for the slight reduction in ozone that happened only during a certain time of year for a month or two. Instead, trillions were spent to force reliance upon less efficient refrigerants, expensive mandated changes, and nothing but hysteria in every corner. And as to those new, less efficient refrigerants that no longer “harmed the atmosphere”… now they’re being targeted as a greenhouse gas. And is it any surprise that the patents are expiring for them? Follow the money – you’ll find the truth. There is no man-made ozone depletion, nor man-made global warming. Nothing but man-made greed that the consumers end up paying for in the long run. It’s always nice for a corporation to have a scientist in their back pocket, isn’t it?